Two free shows, a 4:30 p.m. show for young scientists between the ages of three and eight and a 6:30 p.m. show for big kids ages nine and up, will be taking place at the UW-Green Bay, Manitowoc Campus in the University Theatre on Thursday, May 2, 2019. These ‘cool’ events will give attendees the chance experience explosions, color-changing solutions, solid foams, dry ice fog, fire and even more explosions. Attendees can also make their own slime after the show. Doors will open 45 minutes prior to the show, with only 350 people to be admitted. For more information, contact UW-Green Bay, Manitowoc Campus Associate Prof. Amy Kabrhel (Chemistry) at 920-683-2746 or kabrhela@uwgb.edu. The Spring MUSE Concert (Music of the University Soloists and Ensembles) will be taking place at the UW-Green Bay, Sheboygan Campus in the Fine Arts Theatre on Thursday, May 2, 2019 at 7 p.m. The Jazz Ensemble, the University Chorus and the Vocal Jazz Ensemble will use this concert to begin the official end of year festivities. Selections for MUSE concerts challenge performers and engage audience members. Tickets are $10 for adults and free to all students from any UW-Green Bay campus (with student ID). The box office will open at 6 p.m. This entry was posted in News and tagged concert, Music, Sheboygan Campus on April 24, 2019 by Editorial Student. 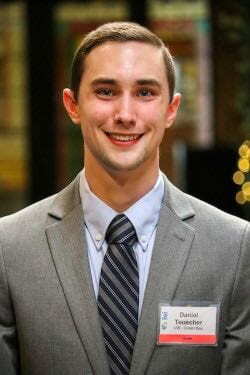 UW-Green Bay, Manitowoc Campus student research projects will be presented during an annual campus-wide symposium from 9 a.m. to 1 p.m. on Tuesday, May 7, 2019 at the UW-Green Bay, Manitowoc Campus. The community is invited to view the research and meet with students to ask questions and learn more about the specific projects. The Undergraduate Research and Creativity Symposium features posters, oral presentations, creative writing and art work prepared by more than 50 students in a wide variety of academic disciplines including creative writing, geography, biology, chemistry, art, psychology and literature. This year’s event will include projects from students at the Manitowoc Campus, Green Bay Campus and Valders High School. The symposium at UW-Green Bay, Manitowoc Campus is currently funded through a grant from the UW System. For more information, email vanslooj@uwgb.edu. The opening reception of “Into the Fray: A Journey Through Ambient Space” will take place on Thursday, May 2, 2019 from 4:30 p.m. to 6:30 p.m. in the Lawton Gallery, located in UW-Green Bay’s Theatre Hall. “Into the Fray” is an exhibition of paintings and drawings by current artist-in-residence Lydia Dildilian exploring human perception of time and space through landscape. A scholarship award ceremony will take place at 5 p.m. The exhibition will be up at the Lawton Gallery through Thursday, May 16, 2019. The Lawton Gallery hours are Tuesday through Saturday, 10 a.m. to 3 p.m. This entry was posted in Announcements and tagged exhibit, Lawton Gallery, reception, Theatre Hall on April 24, 2019 by Editorial Student. Cofrin Library recently updated the appearance of the sign-in page that users see when accessing electronic resources. 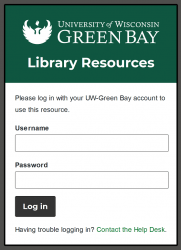 The URL of the sign-in page has not changed and still begins with https://ezproxy.uwgb.edu. When you view an article, database, or e-book through the library, you need to verify that you are affiliated with the University. 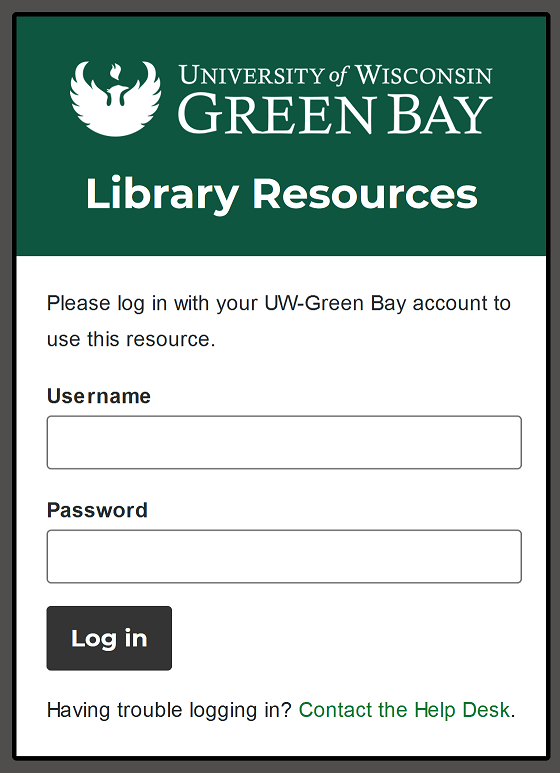 For most resources this is done automatically when you are connected to the campus network, but when you are off-campus you need to sign in with your UW-Green Bay username and password. The new sign-in page better aligns with the University’s web presence and meets accessibility standards. Please contact the Research Desk if you have any questions. To sign up, please contact Associate Prof. Adam Gaines (Music) 920-465-2440 or gainesa@uwgb.edu.